Unhappy and unfulfilled in your present career and really want to pursue something completely different, but you don’t? You want to go for that promotion but find yourself stopping short of applying for it? You really want to be in a serious relationship but find yourself backing away to avoid commitment? Maybe you are thinking about being involved in a community volunteer organization but never take the first step to inquire. When your heart yearns for something new but you stop yourself short of going after it, do you ever ask yourself why? Fear of failure is often the culprit. Fear can paralyze us from moving forward on what really matters to us. These unspoken fears may be influencing our decisions and behaviors (Berger, W 2018). Fear of failure is one of the biggest reasons people hold themselves back from pursuing opportunities. We have an endless stream of thoughts, judgments and self-criticism which stop us dead in our tracks. Voices in our heads shout: “people will think less of me, they will label me a failure, I will feel vulnerable, exposed, naked, and I can’t handle it.” You try to silence your inner critic but you can’t. I can relate. I am no stranger to fear of failure. Very early in my healthcare career, I was invited to present a workshop for women, a very high profile opportunity. This was no ordinary workshop. It was for the new women’s pavilion, an important business unit for the health system I worked for. While my heart said, “hell, yes, you are going to do this, what a wonderful opportunity for you, you should be excited and grateful!” My mind said something very different, “are you kidding? You haven’t done workshops before, and this one is very high profile. What if you fail? Are you really willing to risk your good reputation to do this?” If I accepted this invitation, I would be stepping outside my comfort zone. It was scary and I was afraid of failing. Since that time, I don’t let fear hold me hostage anymore. It still tries to air its ugly head from time to time but I now know where it is coming from and how to better deal with it. For example, when I transitioned from healthcare executive to life and leadership coach and started my own business about two years ago, I experienced some fear, fear of building a successful business and fear that my weekly blog posts on social media wouldn’t be good enough. Initially, I started obsessing again aiming for perfection. Remembering that perfect is the enemy of good and stepping outside my comfort zone brings opportunity, I got past my fear. I will not let fear hold me back from sharing my gifts especially knowing it can make a difference in other people’s lives. In her book, “Daring Greatly,” author Brene Brown writes about how allowing yourself to be vulnerable, exposing your heart to risk and stepping into the void of ‘I don’t know if this will work’ is truly one of the most courageous things we as humans can do. (Kitto, M (2016). It takes courage to step outside our comfort zone but this is where possibility and opportunity lives. It is where we can find our dreams and aspirations. Moving from where we are to where we want to be on our life journey, we have to confront our fears. I would like to offer my thoughts and strategies for overcoming the fear that is paralyzing us. First, recognize that fear is self-created. We frighten ourselves by fantasizing negative outcomes to anything we might pursue. We may be ruminating over past experiences that did not go well or worrying about a future that may never happen. You may have heard of the acronym, “F-E-A-R: Fantasized Experiences Appearing Real.” Rather than living in the present moment, our minds take us to the past or to the perceived future where we then formulate what our outcome will be. It feels real and scary but it is related to our thoughts. Science tells us that approximately 80% of the 40,000 to 50,000 thoughts we have daily are negative. It’s important to focus on the present moment because, if you think about it, the present moment is all we really have. The past is history and the future is unknown. We fear things that may never happen. Redefine Failure. A good place to start is to define “failure.” We get to define what failure is and what we want to label as a failure. This failure we are all so afraid of is actually a choice. We get to make the choice. Whatever we are pursuing in life, whether it is business, a new career, relationships, or whatever, there will be times when things do not work out as planned. Failure is just feedback showing us what’s not working so we can find out what will work. Learning from our mistakes is invaluable in life. Anyone who has achieved great things, anyone who has changed the world has, at some point, made a choice to embrace and redefine failure rather than let it hold them back. Ask yourself, “what’s worth doing EVEN IF I fail? Maybe my new business has a very slow start as defined by modern standards. Is it a failure then? What if I am making a difference for others, helping improve lives? I may need to course correct some things in my business (failure redefined as feedback) but there is already value in the services I’m providing. 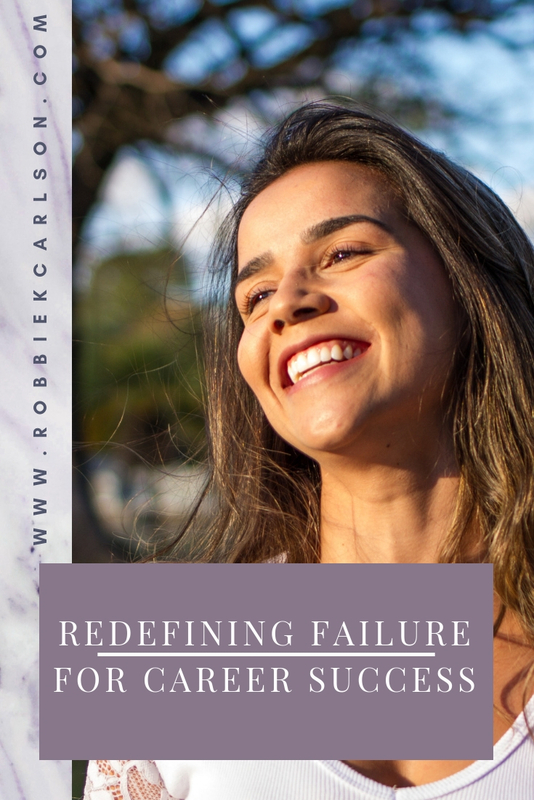 Create a “fear list.” In her article, “How to Overcome Your Fear of Failure,” author Susan Peppercorn suggests creating a checklist of what you are afraid to do and what you fear will happen if you do it. Write down the benefits of the attempted effort and also the cost of doing nothing. Walking away from an opportunity may be far more harmful than stepping outside your comfort zone to pursue it. Another strategy to consider is to restate your list of what you are afraid of. For example, if you are afraid of leaving a job you hate, you could restate it as, “I want to leave this job I hate to pursue my dream, and I scare myself by imagining I would go bankrupt and lose my house.” You can see how YOU are the one creating the fear here. (Canfield, J 2015) Once again, you are focused on a future outcome that may never happen. Focus on the positive energy of the desired outcome. Author, Warren Berger, in his article, “What Are You So Afraid of?” suggests focusing on the desired outcome and the energy surrounding that rather than the actual thing that is inducing the fear. That outcome may be a personal benefit or involve having a positive impact on others. (Berger, W. 2018). In my previous example, despite an initial slow start to my business, I knew I was making a profound difference with the individuals I coach and those who read my weekly blogs. Recall when you triumphed in the face of fear. Try to recall a time when you were successful at a new endeavor despite your fear of failure. Perhaps you are going for an exciting job promotion but nervous about the interview. Think about all the times you “aced” an interview, despite your fears, and were thrilled to get the job. What did you do, how did you prepare, what feedback did you get? Focus on what you did well. Hire a professional coach. Despite all your efforts, there may be times when you just can’t get past your fears. You may have a limiting belief that you are unaware of. You feel that you are not enough: not smart enough, not good enough, too old, too young, whatever. Because of your fear, you remain stuck, and are reluctant to pursue almost anything new. A professional coach can help you discover what you cannot see for yourself. S/he can support you through your fears, keep you focused and help you confront your unconscious behaviors and old patterns. A coach helps you move forward with your life, helps you discover the possibilities, address obstacles and overcome barriers to achieving success. Don’t give up on your dreams and aspirations. Don’t let fear paralyze you from moving forward with your life. Consider trying one of the strategies I’ve outlined above to move beyond your self-created fears. In the event you still cannot get past your fears, consider reaching out to a professional coach.